Bright Computer Education was born with a dream of making quality education affordable and accessible to all. We have Excellent Faculties, Successful Students, Quality, Affordable Education, Student Job Placement, Quality Facilities and Infrastructure, Student Preparedness for Professional Certifications. 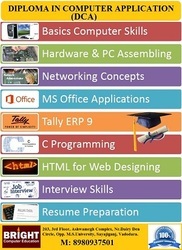 We provide Basic Computer Skills, Computer Hardware & PC Assembling, Networking, IT Security and Software training, whole brain development program, MS Office Applications, Tally Erp 9, C Programming, HTML for web designing, Interview Skills, Resume Preparation and programs to enhance creativity. Keeping in mind the needs of such candidates, we have designed our processes in a manner that every task starting from Education to Job to make professionalism in their career. For more details contact us on 8980937501.